At 260g, the Apex City helmet is a surprisingly svelte, civvies-friendly commuter lid for shorter hops at a moderate pace. However, longer, faster outings revealed that its relatively modest ventilation couldn't keep up. Conforming to CE1078/A1 and available in a choice of graphite, white or yellow, the City's standard of in-mould construction is as tidy as we've come to expect these days, though there's an exposed expanded polystyrene liner that theoretically leaves it more vulnerable to everyday, accidental carelessness. The Apex CIty's styling clearly takes its lead from the urban/skate/BMX school. Its angular profiles match both business and casual street clothes better than either 'Cromwell' or road racing and trail helmet designs. 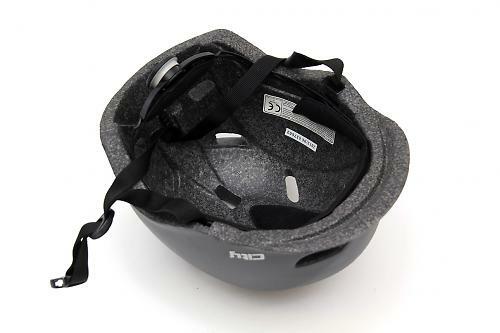 Its greater coverage also improves protection to the wearer's neck in the event of a spill. Initial adjustment is s a cinch: thirty seconds or so's work thanks to the intuitive strap and oversized thumbwheel system. An integral peak is another useful feature. The City's modest offering does a surprisingly good job of keeping wind, rain, dust and other nasty airborne particles from the eyes. Initial impressions were favourable, then. Our medium-size sample trumps many a race lid weight-wise and I barely noticed it in cooler conditions at a leisurely 14mph and distances of three to five miles. More is generally better when it comes to vents. With the fashion for inlet and exhaust vents, a mere 12 small slots had me worried. On the plus side, this greatly reduces the likelihood of arriving at work or social venues looking like a drowned rat. Spirited 15 mile commutes called its bluff though and on occasion threatened to saturate the pads and boil my brains. Summing up, the Apex City is by no means a bad choice for someone wanting a helmet that complements street clothing and who's looking to scoot a few miles round town but there are much better options for longer, faster rides. 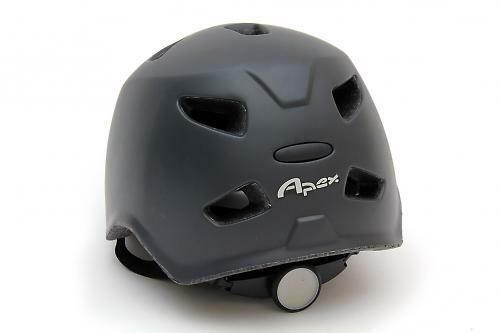 The Apex city helmet seems to be aimed at commuter/utility/leisure audiences and complements street attire better than most-if that's important to you. Very light for a lid of this genre. Overall, this is a stylish, lightweight and in many respects likeable helmet for commuting/utility riding spoilt by modest ventilation. Lightweight and complements street attire well. Ventilation too modest for speedier/longer commutes. Would you recommend the product to a friend? On balance probably not.